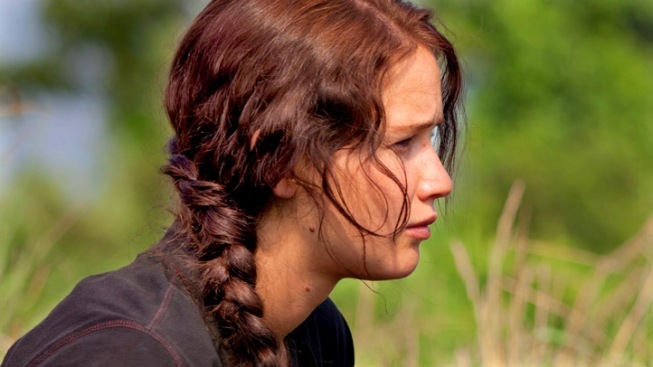 "The Hunger Games" has been a worldwide best seller, and now it's the first legitimate blockbuster of 2012, having taken in a record-setting $155 million in its opening weekend. But what, exactly, is the secret behind the phenomenal popularity of the story? The film’s cast and crew give PopcornBiz their take on the appeal of author Suzanne Collins' creation. Jennifer Lawrence (Katniss Everdeen): Because this is the generation that's obsessed with reality television and watching people's lives fall apart while we eat popcorn. This is the new generation that's kind of started this obsession, and I'm every bit a part of it. Also, I think that people love following a character like this who's a hero that doesn't mean to be a hero, that kind of goes against all odds and fights back when something is wrong and doesn't stay quiet. Liam Hemsworth (Gale Hawthorne): Any great stories have characters that you care about. For me as a fan of the books, when I was reading those books, you have so many very strong characters, very good people that are in a horrible situation and you want to see them get out of it. You care about them, you’re there with them, so that was kind of where it was for me and also you have this extraordinary girl that’s providing hope and courage to everyone around her, that they can have the courage to stand up, and if we come together we can fight this. Josh Hutcherson (Peeta Mellark): I think the whole world that Suzanne created is so interesting – the idea of combining reality TV with a totalitarian dictatorship government is interesting. As well as the way Suzanne writes: she’s realized that kids these days aren’t like kids in the ‘90s, ‘80s and other decades. They’re so much more advanced. I have a 15-year-old brother that you can talk to like he’s a full adult, so she doesn’t condescend to the readers, she doesn’t talk down or try to spoon feed them information. It’s done in a very level-playing-field kind of way. I think that’s kind of why adults can read the book and find it just as interesting as teens do. Gary Ross (director): I think that on the one hand it’s a harrowing premise that’s completely engaging, but I think the fact that Katniss fights to preserve her own humanity in the face of it and won’t play their game and stays a human being. Really what this comes down to is a very human story and someone who finds her own ethical center. And in finding that and saying at the beginning she’s fighting to survive and [learn if] she’s willing to sacrifice her life rather than violate her own morality, an empathy she’s discovered within herself – that’s resonant with anybody and that’s the reason I wanted to do the film. Elizabeth Banks (Effie Trinket): First of all you start with a rebellious teenage girl. Hello – classic heroine. Love triangle – great. That totally draws all the ladies in, and then there's this crazy battle royale happening – good for guys. They love that stuff. Then you have all this crazy political stuff, which my father-in-law loves. Suzanne's pulling from really great literature. I think there was a lot of [George] Orwell. There's Greek and Roman literature in here. We have to remember that in ancient Rome they had Bread and Circuses and threw people to lions for entertainment. In our human history, we're not great with each other. We treat each other pretty badly. So I don't think that this is very far off, and that's why I think it's hitting a chord with everyone. It's reminding people that light and love and hope can be more powerful, obviously, than the dark side. George Lucas really said it all the best: Don't choose the dark side.